Notes This is an absolutely iconic design and it’s an oddity because this design was only distributed in the UK. We’ll post about the design for the rest of the world in a few days. I first saw this version at the tender age of 8, in 1974, when my dad brought it home. A lifelong classical music stalwart, Autobahn was his one concession to popular music and it had a profound effect on me. I listened to the 22 minute title track over and over again on his headphones, loving the synthesized sound of the cars whooshing from one ear to the other, right through the middle of my head. The bridge that crosses the two white lines always seemed to symbolise my headphones listening in to the roar of traffic martialled into a modern-day symphony. The two pieces of brown sticky tape affixed to the lower corners makes my copy unique. I recently asked why they were there and was reminded that my Dad had to repair the sleeve after numerous borrowings in my teenage years. It’s the nearest thing to a family heirloom I’ve got. 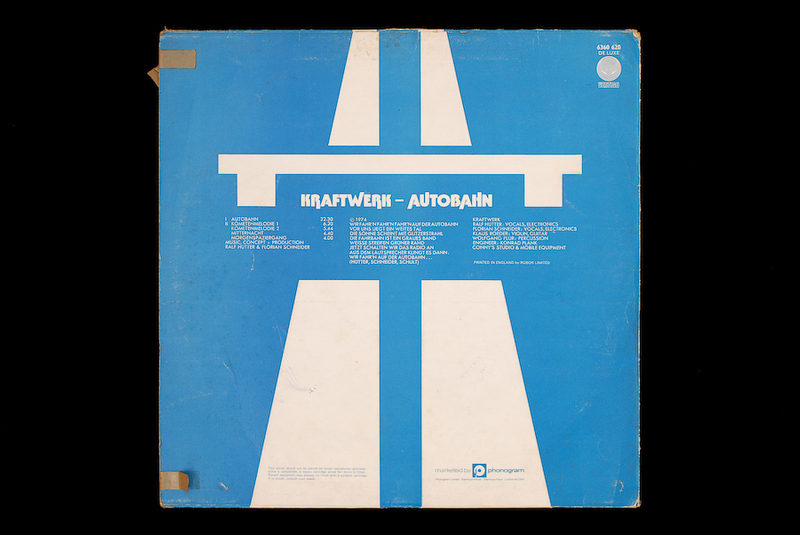 Autobahn is fascinating because of its translation of the concept of travel into musical form. This transmission from one medium to another wasn’t a new one, but the extent to which it reduced the distance between musical composition and referent was and remains striking. Its central motif isn’t a melody, but the sound of cars approaching and moving away from the listener. The design perfectly encapsulates this by appropriating the motorway symbol and placing it so that it fills the cover from top to bottom. There is no end to the journey in graphic terms, it’s implied that the road continues outside the frame of the cover. Similarly the music ends with one more passing car rather than the sound, say, of an engine being turned off (Autobahn’s railway counterpart, Trans-Europe Express, ends with the sound of train brakes squealing). 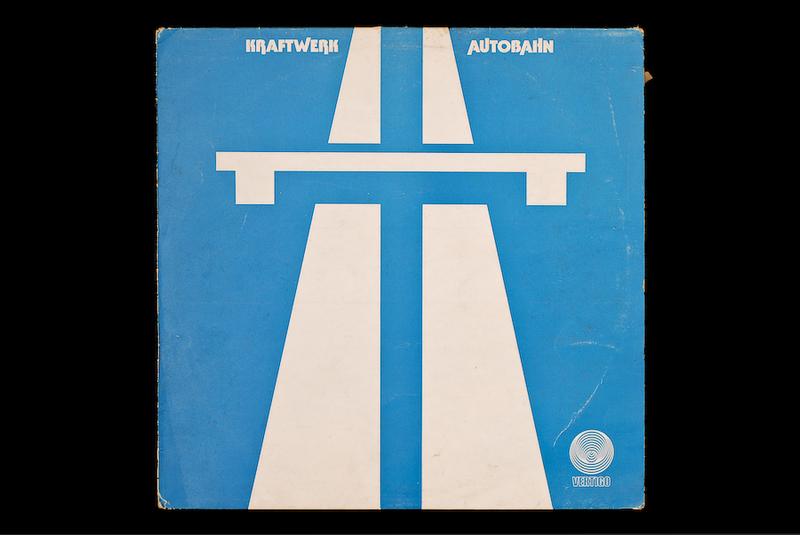 Autobahn is an utterly brilliant synergy between music, concept and visual design. 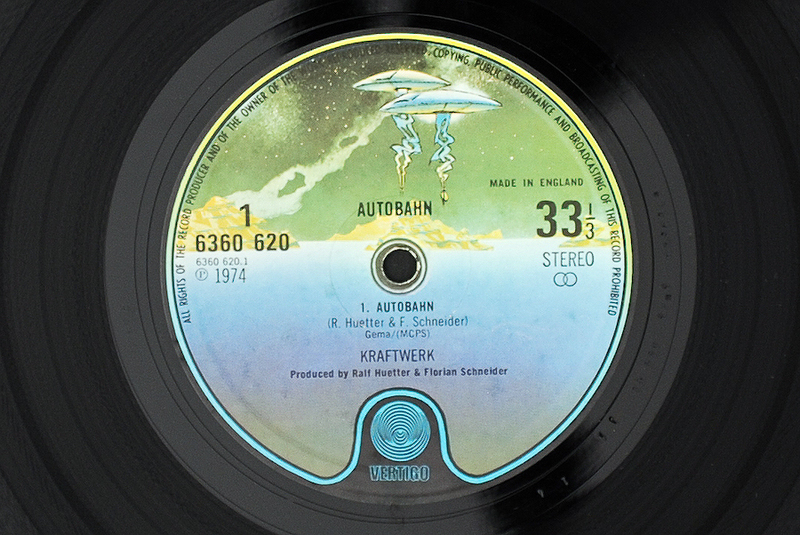 One last thing: there’s no designer credit on the Autobahn sleeve which seems fittingly utilitarian. Is this the original sleeve? Or was this some sort of UK re-issue? I’ve always thought the sleeve was the sleeve with the paste-up/cut-outs of the German cars on the road with the sun setting behind the hills. 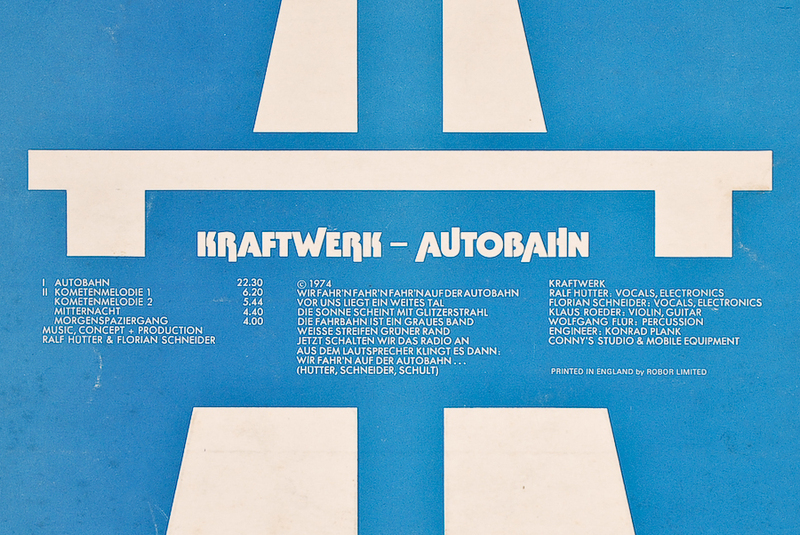 The inner sleeve was the blue and white road iconography. Hello Jinsai, I guess my notes should have explained – I’ll update them. This was, I believe, the UK cover. It’s unclear why it was so markedly different from the rest of the world. I’m going to do the next post on the other version. I don’t think the inner sleeve ever featured the road icon, but as you’ll see the front sleeve did sport at least on some versions a sticker bearing the image.